Please complete the following fields to receive bids from vendors with a Ford Ranger Engine for sale! In a bid to give Japanese small pickup trucks some stiff competition, the Ford Motor Company introduced the Ranger in 1983-2011. The base model came with 2.3Liter four-cylinder engine, which offered only 80 horsepower. However, later in the year, an optional 2.8 Liter V6 engine was introduced, which was more powerful as it reliably produced 115 horsepower. The transmission choices offered for the Ford Ranger were comprised of standard four-speed manual, optional five-speed manual or optional three-speed automatic packages. In 1986, the 2.8 Liter V6 engine was replaced by 2.9Liter fuel-injected engine, which produced 140 horsepower. In the year 1990, 4.0L V6 engine with 160hp was unveiled for four-wheel-drive version of Ford Ranger. In 1991, the 3.0Liter V6 engine with 140hp capacity made it’s debut. It was a good engine option for a two-wheel-drive Ranger. This engine, which is also used in the Ford Taurus and Toyota Tacoma, is readily available in different auto stores for sale. After 10 long years, Ford Ranger was given a facelift in the year 1993. In 1994, Mazda borrowed the Ford Ranger’s platform to build its B-Series pickup trucks. In 1997, five-speed automatic gearboxes together with the 4.0Liter V6 engine became an available option for the Ford Range to enhance the performance and fuel efficiency of the pickup truck. In the years ranging between 1998 and 2011, several cosmetic changes were made to the Ford Ranger that helped it excel over its competitors. In 1998, 2.3Liter engine was replaced by a larger 2.5Liter four-cylinder engine with 117hp capacity. This replacement made the pickup truck a little bit more environmental-friendly. In 2001, while its competitor Nissan Frontier stuck to 3.3Liter 210hp V6 engine, Ford Ranger replaced the 4.0Liter V6 engine with a more powerful SOHC version of the engine from the Ford Explorer. Despite of the replacement, the popularity of 4.0L V6 engine did not shrivel. 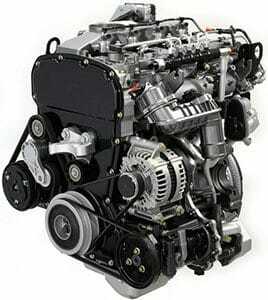 In fact, even today, used engines for sale are available on online auto stores. The latest models of Ranger come with 2.3-liter four-cylinder engine and 4.0-liter V6 engine, and they offer 143 and 207 horsepower respectively. Its contemporaries Toyota Tacoma (2.7L/159hp) and Nissan Frontier (2.5L/152hp) are slightly more powerful. With a 3.5 Liter V6 engine and five-speed automatic gearbox, Honda Ridgeline has certainly toughened the competition. Take advantage of our free engine search tool above to find the right used Ford Ranger engine for your vehicle or browse our comprehensive list of engines and transmissions for sale on the left side of this page.